I am clearly late to the game here, but I saw this over on Living Like the Kings and loved it (Kat is full of these wonderful link ups! Be sure to include the Quarterly Top 5 banner or button in your post to share the link up with your friends. Now, I am, by no means, an expert photographer. The majority of the pictures I take are on my phone (because with a crazy little boy, finding the camera will inevitably mean a lost moment), regardless, here are my quarterly top 5! For whatever reason, we are absolutely fascinated with the dishwasher. Generally he stands in his walker and pulls the silverware out (clean or dirty... doesn't matter!) This time I made the mistake of leaving the door down and walking away for a second. 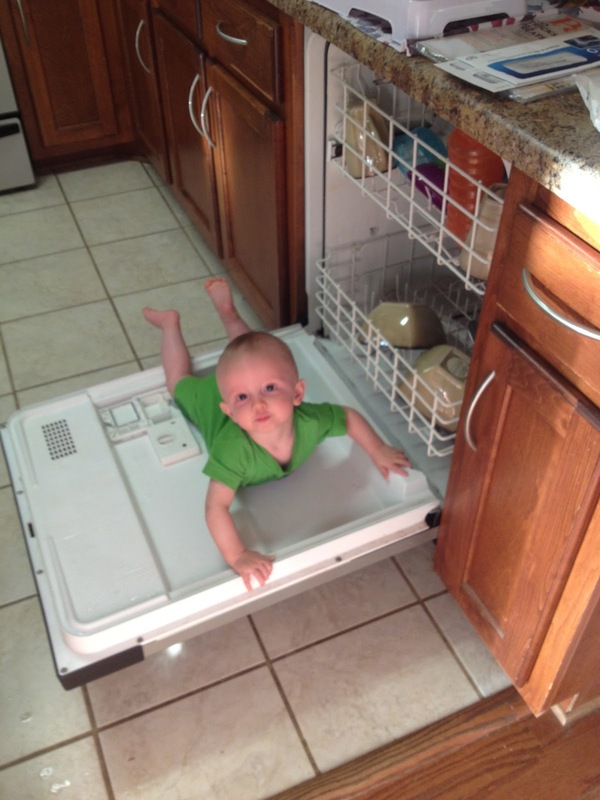 Lets hope he's this into the dishes in the future! Is it wrong that I love this picture as much as I do?!? 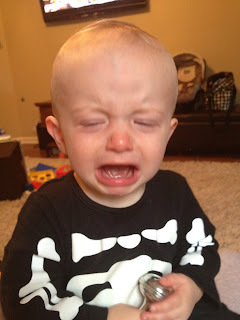 Preston had been sick all day and this was what he looked like 95% of the day, but I just couldn't get over his skeleton jammies and how pitiful he looked! Recently I have seen this face more than I care to think about so its losing its allure quickly! One morning I heard a banging sound coming from his room. 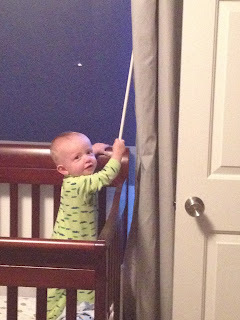 Upon further inspection, I found him standing in his crib banging the blind adjuster against the wall. He was thrilled with his discovery! 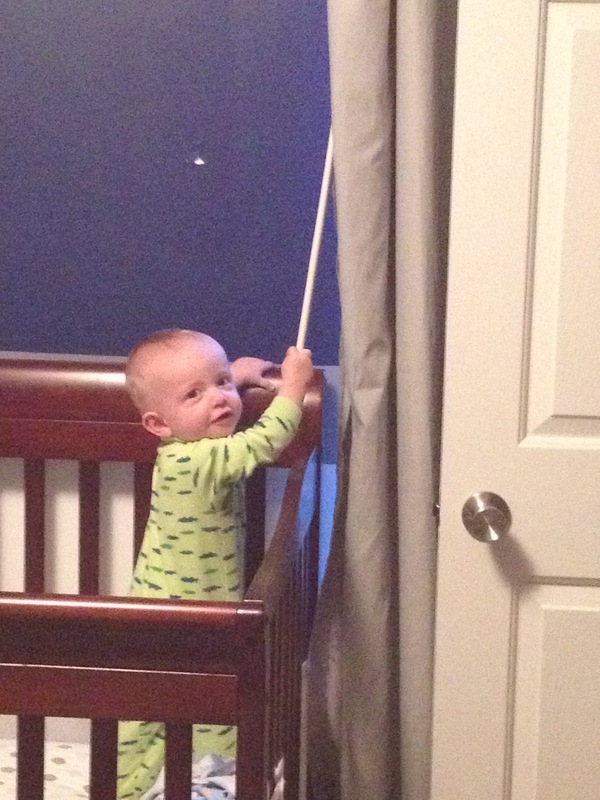 He also kept pulling the curtains back to look outside, which I thought was so stinkin cute! We love to feed ourselves! You can see that he dumped his entire bowl of cheerios on the floor and is eating them that way (which the dogs love!). I also love how you can see his pink/zebra sippy cup in the background courtesy of his friend Molly! (Her mom gave us their old sippy cups so we could figure out which ones he liked before buying 1,000...of course he favors the pink and zebra). There is nothing really special about this picture expect for the fact for the first time HE LOOKS LIKE ME! 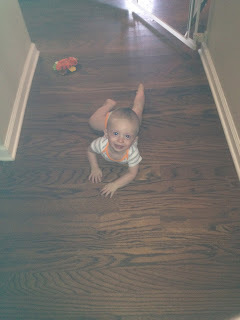 Somewhere there is a picture of me, around the same age, crawling down the hallway. We look identical! We are still trying to unearth that picture, but I cannot wait to see them side by side! Who knew that dishwasher riding was such a cool sport - love it. Love these! That second one is hilarious!